Carlyle just doesn't write a bad book. Some are better than others, but they all guarantee a great read. I loved this one! In this book David, Lord Delacourt, has been secretly obsessed with Cecilia for over six years, and thanks to a bad bet with his brother-in-law Cole (from A Woman Scorned), he finds himself working side-by-side with her at a woman's shelter for 3-months. Cecilia had once rejected his suit years ago, but she gets to see a new side of him that she deeply desires. There is a murder mystery that sets the background to this story, but the real story is the heat and passion that erupts between these two. I loved it!! Even when they are fighting you can feel the heat. This is a steamy, sensual book that kept me glued to the pages. 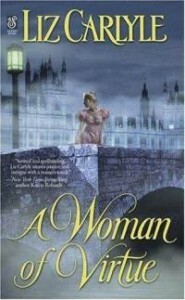 A Woman of Virtue is one of Liz Carlyle earlier books, and it introduces us to several characters we will see in her later books (including the yummy Hell-Bent Bentley from "The Devil You Know", Maximillian de Rohan from "No True Gentleman" and Giles, Lord Walrafen, from "A Deal with The Devil".) Plus another entertaining experience with the valet-turned-antique-dealer Kemble. If you have read her more recent books this is a great one to catch up with. Most LC books can be read in any order, but I will note that there appears to be a great deal of overlap in this book from the book A Woman Scorned. Since I have not yet read that book, it made it a bit hard to follow some of the background story of David's past and his connection with Jonet (Cole's wife and heroine of A Woman Scorned). There appears to be spoilers in this book, so I find myself wishing that I read A Woman Scorned first. Oh well, I will read it anyway and am sure to enjoy it none-the-less.